59% of the 1Q18 results were in line, with circa 15% surprising on the upside. Our 2018 market EPS growth forecast has been raised to 10.1% (from 8.0%) on upgrades in the bank and aviation sectors. We are selective after the outperformance of the FSSTI, which is trading close to mean valuations. 1Q18: No real surprises, slightly more beats. 59% of the reported results were in line with our expectations compared with 55% in 4Q17. However, the number of beats was slightly higher at 15% in 1Q18 compared with 14% in 4Q17. The pleasant surprises were primarily from banks and aviation. DBS and OCBC continued to exceed expectations while SIA’s 4QFY18 earnings trounced the street’s estimate. Rising momentum in 2018 market EPS. Following the 1Q18 results, our overall market EPS growth forecast has been raised to 10.1% from 8.0% while our 2019 market EPS growth forecast remains unchanged at 10.2%. The upward revision for 2018 was mainly due to an upward revision in earnings forecasts for the bank and aviation sectors. However, upgrades were moderated by downgrades in sectors such as technology and telecommunications. Banks – Exceeded expectations, leading to higher target prices. Both DBS and OCBC again exceeded expectations (12% for DBS and 4% for OCBC). NIM expanded 5bp q-o-q for DBS but was flat for OCBC (due to trade loans and Indonesia’s push for single digit lending rate). Wealth management fees of DBS and OCBC grew 49% and 18.6% respectively. Credit costs have fallen to just 13.1bp for DBS and 2.0bp for OCBC as the banks had already recognised substantial NPLs in 2H17 after the transition to SFRS (I) 9. We see upside risk for interest rates and DBS is a key beneficiary as it is the most sensitive to rising interest rates. After the results, we had raised our target prices for DBS by 14% and 3% for OCBC respectively. Aviation – SIA shines yet again, SIAEC exceeded market expectation. SIA’s 4QFY18 exceeded our and market expectations again. Ex-profits from its Krisflyer programme breakage and slot compensation, core net profit more than doubled our forecast as pax yield was 2 S cents higher than our estimate. Forward bookings were also exceptionally strong, rising 48% y-o-y. 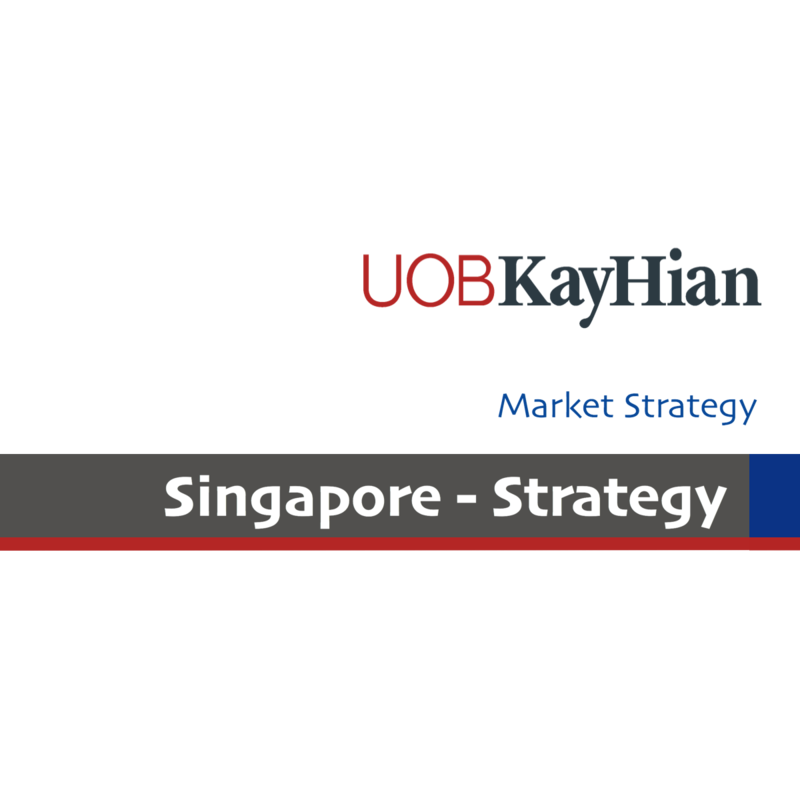 We raised our target price to S$12.60 from S$11.90 post the analyst briefing. SIA Engineering exceeded market expectation but fell short of our expectation. Excluding the S$3.5m impairment charges, earnings were 10% below our estimate. Still, operating profit surprised on the upside as staff costs fell faster than the decline in revenue. Associate and JV earnings fell 7.4% y-o-y, attributed to lower share of profits from engine and component centres. We trim our target price to S$3.80 (from S$4.00) after a slight 5% cut to 2019 earnings forecasts. Telecommunications – Singtel’s 4QFY18 disappointed but comfort from dividend. Singtel’s 4QFY18 results were below our expectation as contributions from the consumer division in Australia were disrupted by a temporary suspension of migration to NBN as well as a decline in Singapore’s EBITDA margin. The only consolation was management’s guidance of a DPS of 17. 5 S cents/share for the next two financial years. Both M1 and StarHub released results based on SFRS(I) 15. We had revised our earnings estimates but maintain SELL for both companies as operating conditions will continue to be tough, owing to intensifying competition with the impending entry of TPG Telecom. Property – Expect better 2H18 developers, S-REITs in line. CapitaLand’s 1Q18 results were in line (1Q18 operating PATMI of S$228.7m were 24.6% of UOBKH’s full- year estimates). Management expects a strong recovery in the Singapore residential property segment, while remaining cautiously optimistic on China. City Development’s 1Q18 performance was below our expectation on lower profit margins for The Criterion EC and absence of contribution from Commonwealth Towers. However, a stronger 2H18 is expected. All the S-REITs delivered in-line 1Q18 results except for Ascott Residence Trust (ART). The miss from ART was largely due to an enlarged unit base from the S$442.7m rights issue (481.7m units issued) to fund the acquisitions of Ascott Orchard Singapore and German properties, and lower-than-expected income streams from these assets. Shipyards – Below, but focusing on oil price and new contracts. Keppel Corp and Sembcorp Marine both missed expectations while Sembcorp Industries delivered in-line 1Q18 results. Keppel Corp’s miss was due to a combination of losses at its O&G division coupled with the absence of land sale gains from Tianjin Eco City. Sembcorp Marine reported an underlying net loss of S$33m in 1Q18 and based on current secured orders, the group expects operating losses to continue for the coming quarters. There were no surprises from Sembcorp Industries’s 1Q18 as utilities saw an improvement, bolstered by China. Keppel Corp (BUY, target S$9.00) remains our top pick for a gradual recovery in the O&M sector, as a asset reflation play and its strong balance sheet. Genting Singapore’s 1Q18 exceeded expectations on a combination of good luck factor and strong VIP gaming volumes. Following this, we raised our FY18-20 EBITDA forecasts by 6-7% and hiked our target price to S$1.38/share (from S$1.30). lag impact from prices committed to earlier under soybean meal contracts, thus expansion in crushing margins is yet to be reflected. Last but not least, SingPost’s 4QFY18 results were below our and market expectations due to weakness from its logistics and mail segment, including some professional fees incurred. The group is still undergoing transformation and will need time but we are encouraged by the turnaround in select key segments. We remain buyers of SingPost with a SOTP-based target of S$1.59. 2018 FSSTI target of 3,710 after latest revisions. Our current themes include multi-year growth drivers, reflation picks, quality laggards and stocks with earnings surprises/specific catalysts. In the large-cap space, we like DBS, OCBC Bank, Keppel Corp, City Developments, CD REIT, CapitaLand Commercial Trust, Ascendas REIT, Singtel, Singapore Post and ST Engineering. Mid-cap gems include Sunningdale, Cityneon, CSE Global and Tianjin Zhongxin.